Everyone loves bacon, right? It’s tough to beat a couple pieces of bacon in the morning with some eggs and toast. Well… at least that’s what I thought before I had smoked bacon. 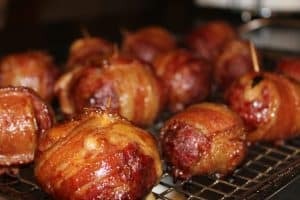 Slow Smoked bacon is one of the tastiest things I’ve ever had, and in this post I’m going to share 5 of my favorite smoked bacon recipes. This is a sponsored conversation written by me on behalf of Albertsons Market Street. The opinions and text are all mine. Before we get into the smoked bacon recipes, let’s talk about what bacon is, and how it’s made. Bacon is pork belly that has been cured with spices, and then smoked low and slow, and sliced thin. Bacon has a high ratio of fat to meat, and that fat in the bacon is what most people love (even if they don’t know it). The fat in bacon adds flavor, and is why bacon is so crispy, and tender. There are a lot of different kinds of bacon you can buy. 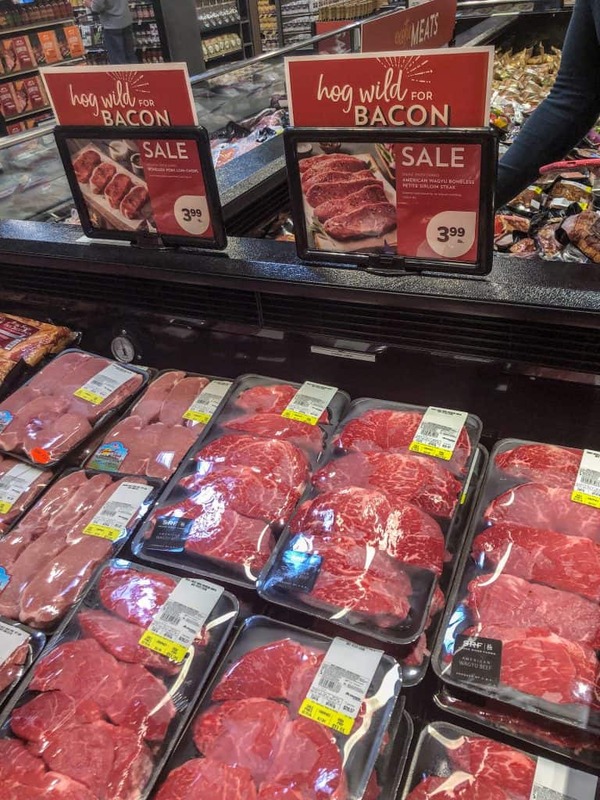 This weekend at Albertson’s Market Street, and Albertson’s on Broadway they are going “hog wild” for bacon. If you love bacon as much as I do, you’ve gotta check out this event. 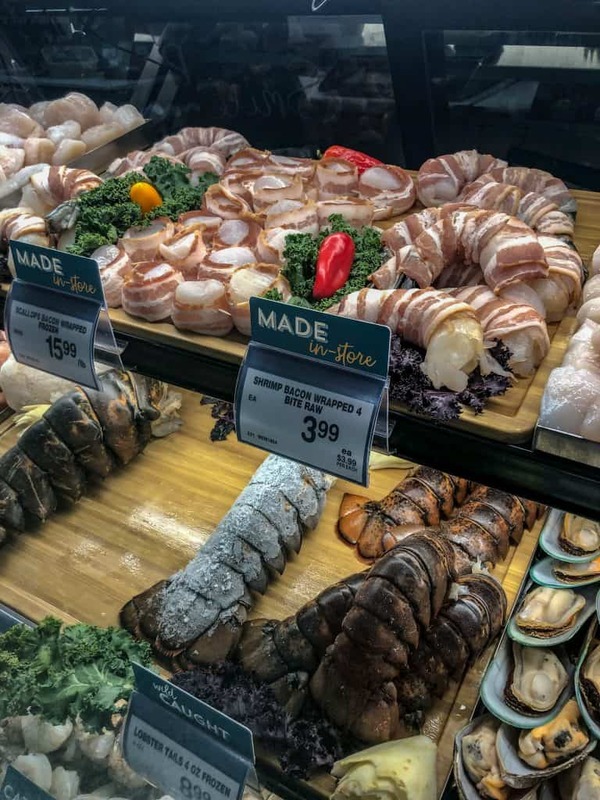 Experts are on hand to share their tips and techniques for cooking with bacon, and they have some GREAT prices on most of the pork products in the store. While you’re there, pick up a slab of pork belly to try your hand at making your own bacon at home, or maybe just pick up a pound or two of bacon to make one of the recipes I’ve highlighted below. 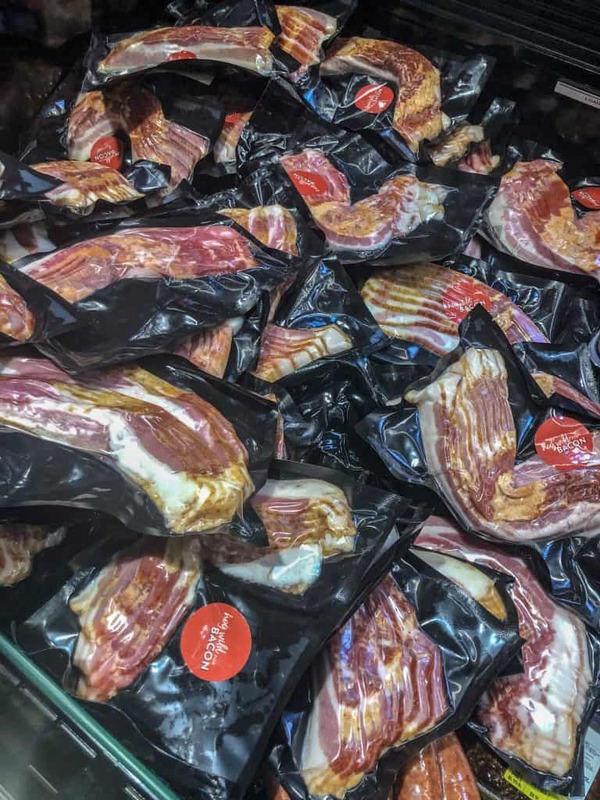 Bulk outs of thick sliced bacon… some of it is 2.49 per pound! Some of the craziest prices I’ve seen on Wagyu beef in a long time. I stocked up. If you can’t make it to either of the stores this weekend, that’s okay! There are event’s like this taking place at Albertson’s Market Street and Albertson’s on Broadway all the time. This is the most popular recipe on Smoked Meat Sunday, and for good reason. The bacon is smoked low and slow for hours in a glaze of brown sugar and maple syrup. If you’ve never had bacon smoked like this, you are missing out. Slow smoked bacon with a maple syrup and brown sugar glaze is everything your taste buds crave. 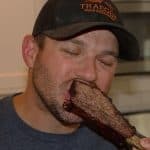 When I first saw pictures of a smoked fatty I thought it was kind of joke. 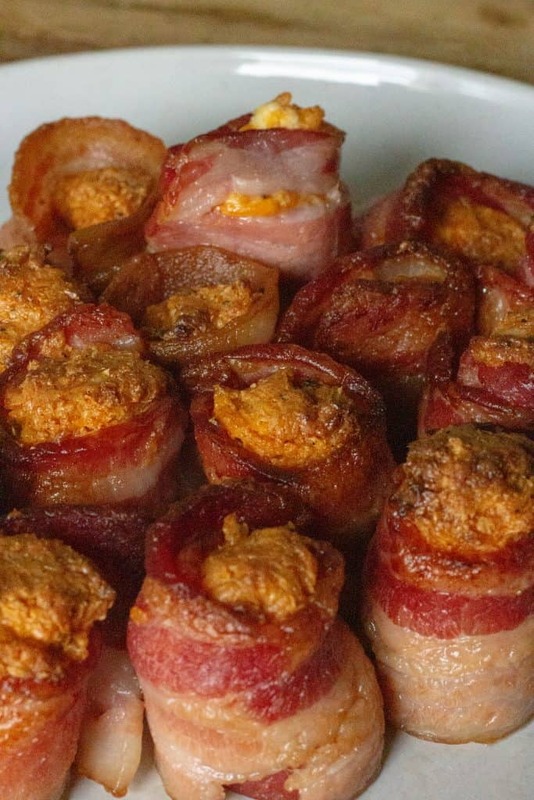 I mean, can a bunch of fillings wrapped in meat, wrapped in bacon really be that good? YES! 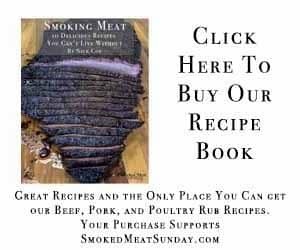 We spend a good amount of time following the keto diet in our household, and the smoked fatty is perfect for anyone following that lifestyle. It’s loaded with flavor, and is unlike anything you have ever tried! If you’re not following the keto diet, smoked fatties are even better. Head over to Albertson’s Market Street and pick up some of their premade frozen mac and cheese, and stuff that fatty with it. I’m drooling just thinking about how amazing that would be. 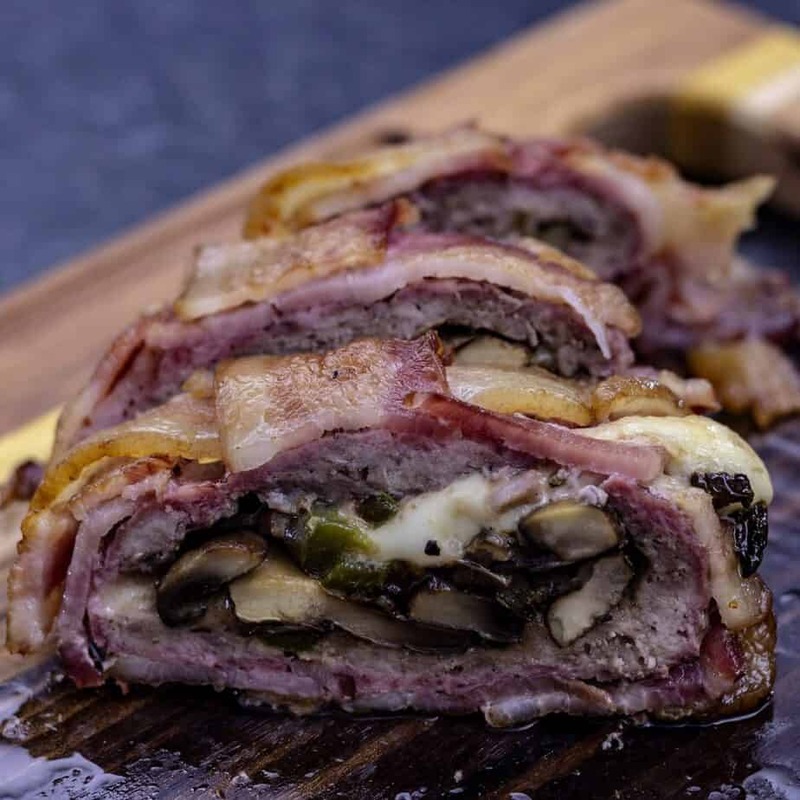 Mushrooms and Green Peppers with Swiss cheese, wrapped in ground beef, pork, and plenty of bacon. 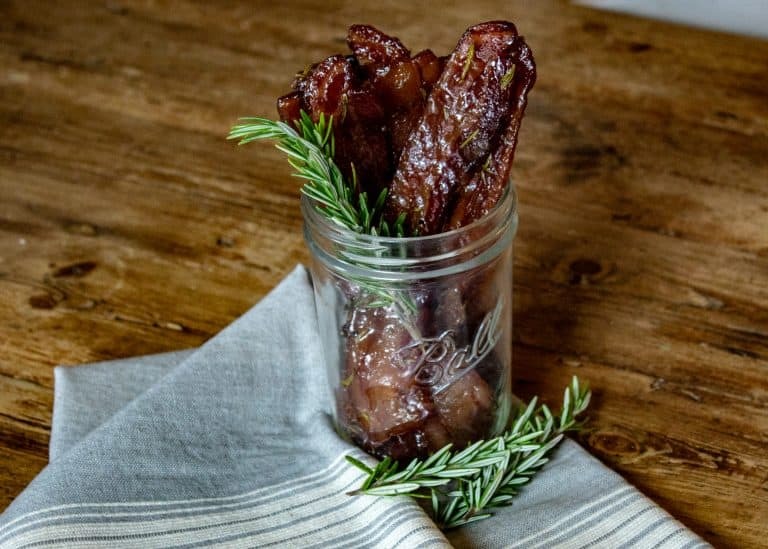 On the surface this bacon looks just like bacon candy, but the addition of rosemary adds an extra level of flavor that is outstanding. 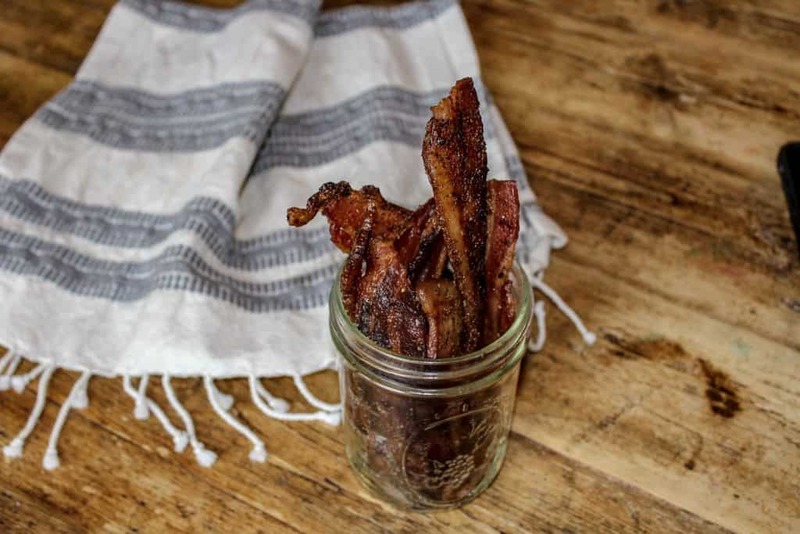 Add rosemary candied bacon to a BLT and hold on to your hat! Rosemary Candied Bacon on a BLT is everything your taste buds need. This one is unique… Bacon Wrapped Stuffed Meatballs can be served as an entree, or as an appetizer. When you’re at Albertsons getting your bacon and beef for this recipe, be sure to get some cheese! Outside of the meat and seafood section at Albertsons Market Street, my second favorite section is the cheese area. Seriously, they have pretty much any type of cheese you could ever want. My current favorite is Asiago Fresca. Just like Albertsons Market street and Albertsons on Broadway this weekend, I’m definitely hog wild for bacon. 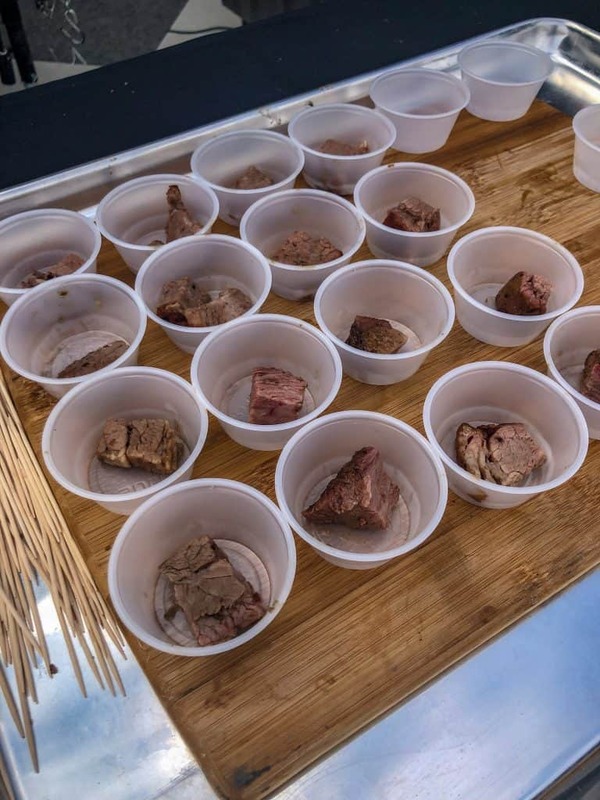 Pig shots are one of those recipes that when you hear about it, you think it’s a little bit crazy. I dare you to eat just one of these smoked pig shots. Slice the bacon in half, and then wrap each sausage with the bacon, forming a bowl on top of the sausage. Use a toothpick, or a skewer to hold the bacon in place. 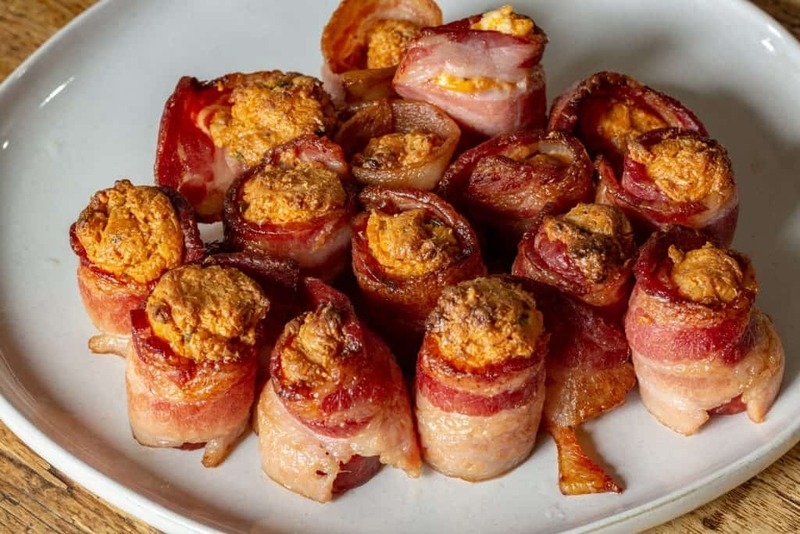 Combine the rest of the ingredients in a bowl, and then using a small cookie scoop, scoop some of the cheese filling into each of the bacon shot glasses. Place the pig shots on a grill rack, over a foil-lined baking sheet into your smoker. Let them smoke at 150 degrees for a half hour, and then adjust the temperature to 400 degrees. Let the bacon shots cook until the bacon is crispy and the tops are slightly browned. For a printable version of this recipe scroll down to the end of this post. There you have it, my five favorite smoked bacon recipes. 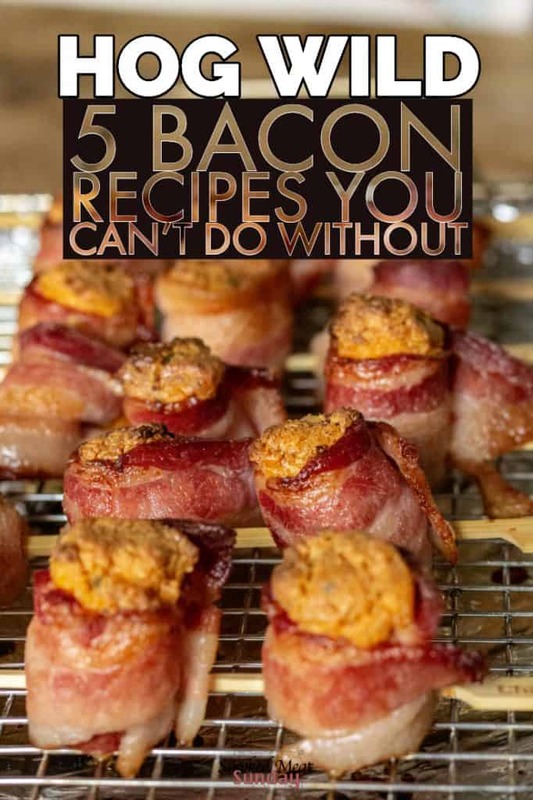 All of these recipes are easy to make, and since they have bacon in them, you know they’ve got to be good, right? 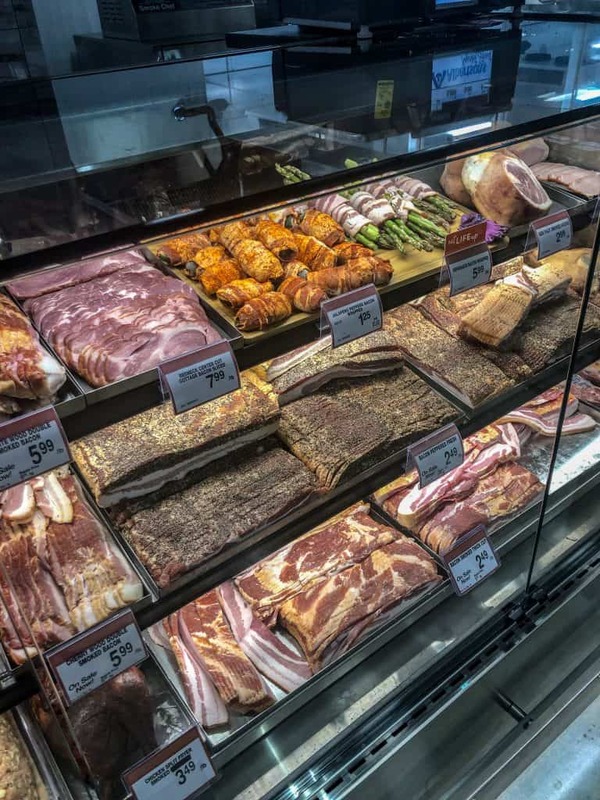 If you live in Boise head over to Albertsons Market Street or Albertsons on Broadway to check out there Hog Wild for Bacon event, and while you’re there, pick up a pack or two of bacon, and try a few of these delicious smoked bacon recipes! I’m definitely hog wild for bacon. Pig shots are one of those recipes that when you hear about it, you think it’s a little bit crazy. Slice the bacon in half, and then wrap each sausage with the bacon, forming a bowl on top of the sausage. Use a toothpick, or a skewer to hold the bacon in place. 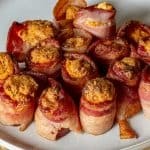 Combine the rest of the ingredients in a bowl, and then using a small cookie scoop, scoop some of the cheese filling into each of the bacon shot glasses. Place the pig shots on a grill rack, over a foil lined baking sheet into your smoker. Let them smoke at 150 degrees for a half hour, and then adjust the temperature to 400 degrees. Let the bacon shots cook until the bacon is crispy and the tops are slightly browned.